WASHINGTON (AP) — They huddle outside office buildings and they can't satisfy their nicotine cravings by lighting up on planes and trains, but now smokers could be getting a break from an unlikely source. A glitch involving President Barack Obama's health care law means smokers may get at least some relief next year from tobacco-use penalties that could have made their premiums unaffordable. In yet another health care overhaul delay, the administration has quietly notified insurers that a computer system problem will limit penalties that the law says the companies may charge smokers. A fix will take at least a year. 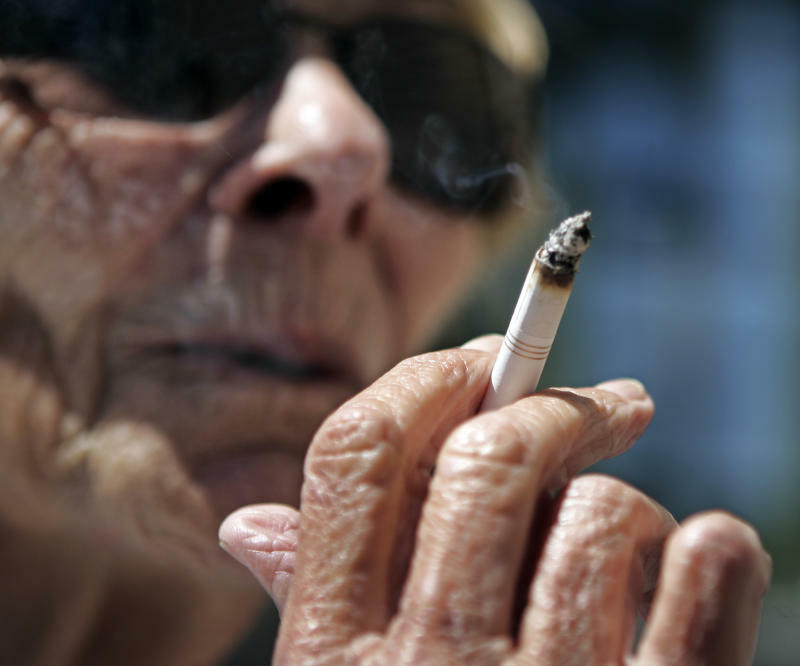 Older smokers are more likely to benefit from the glitch, experts say. But depending on how insurers respond to it, it's also possible that younger smokers could wind up facing higher penalties than they otherwise would have. Some see an emerging pattern of last-minute switches and delays as the administration scrambles to prepare the Oct. 1 launch of new health insurance markets for people who don't have job-based insurance. Last week, the White House unexpectedly announced a one-year postponement of a major provision in the law that requires larger employers to offer coverage or face fines. The smokers' glitch is "a temporary circumstance that in no way impacts our ability to open the marketplaces on Oct. 1," Health and Human Services spokeswoman Joanne Peters said in a statement. "Because of a system limitation ... the system currently cannot process a premium for a 65-year-old smoker that is ... more than three times the premium of a 21-year-old smoker," the industry guidance said. If an insurer tries to charge more, "the submission of the (insurer) will be rejected by the system," it added. Starting in 2014, the law requires insurance companies to accept all applicants regardless of pre-existing medical problems. But it also allows them to charge smokers up to 50 percent higher premiums — a way for insurers to ward off bad risks. For an older smoker, the cost of the full penalty could be prohibitive. Premiums for a standard "silver" insurance plan would be about $9,000 a year for a 64-year-old non-smoker, according to the online Kaiser Health Reform Subsidy Calculator. That's before any tax credits, available on a sliding scale based on income. For a smoker of the same age, the full 50 percent penalty would add more than $4,500 to the cost of the policy, bringing it to nearly $13,600. And new tax credits available to help pay premiums cannot be used to offset the penalty. The underlying reason for the glitch is another provision in the health care law that says insurers can't charge older customers more than three times what they charge the youngest adults in the pool. The government's computer system has been unable to accommodate the two. The administration is suggesting that insurers limit the penalties across all age groups. The HHS guidance document used the example of a 20 percent penalty for young and old alike. In that case the premium for a 64-year-old would be about $10,900, a significant cut from the $13,600 if insurers charged the full penalty. Younger smokers and older smokers can still be charged different penalties, but if the total of premiums and penalties is more than three times greater for older smokers, the system will kick it out. Insurers had not expected such limitations. Before the glitch popped up, experts said the companies would probably charge low penalties for younger smokers, and much higher ones for older ones. "Generally a 20-year-old who smokes probably doesn't have much higher health costs than someone who doesn't smoke in any given year," said Larry Levitt, an insurance market expert with the nonpartisan Kaiser Family Foundation. "A 60-year-old is another story." It's unclear what insurance companies will do. Another workaround for the companies would be to charge the full penalty to both younger and older smokers. In that case, there wouldn't be any savings for older smokers, and younger ones would see a big price shock. Levitt said he suspects insurers will keep the penalties low to sign up more young people. That's happened so far in three states, he added. But health care industry consultant Bob Laszweski said he thinks insurers will do the opposite, hitting young and old with high penalties. "It's going to throw cold water on efforts to get younger people to sign up," he said. Workers covered through job-based health plans would be able to avoid tobacco penalties by joining smoking cessation programs because employer plans operate under different rules. That option is not guaranteed to smokers trying to purchase coverage individually, prompting 10 states already to limit what insurers can charge smokers buying individual coverage.